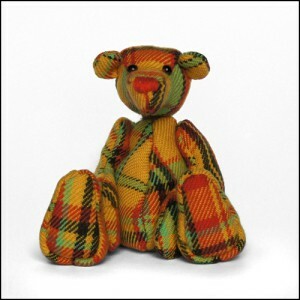 Lottie is a colourful 4″ sitting teddy bear handmade using carefully selected 100% wool. Her colours were carefully considered to ensure the right proportions were achieved in the finished check design. Her fabric is entirely handwoven and sewn together by hand. She has been filled with glass beads and is fully jointed to make her delightful to hold. Her face is finished off with glass eyes and a hand stitched nose.